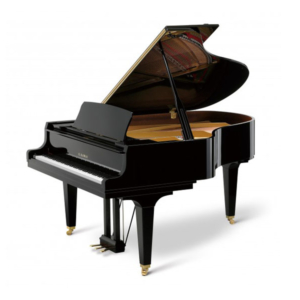 Boston GP215 – The Boston grand piano offers a larger soundboard in comparison to other pianos of the same length, due to its innovative “wide tail” design. This wider construction of the case means that a 5’ 10” Boston grand has the same soundboard area as a typical 6’ 2” grand piano, creating the power, richness, and feel of playing a much larger piano. When you first touch the keys of a Boston piano, be prepared to experience an entirely new sensation. Unexpected power suddenly fills the room. You immediately notice the rich fullness of the sound. The keys respond almost intuitively to your fingers. But, because it was designed to take advantage of the efficiencies of high technology manufacturing, the Boston is also remarkably affordable. It’s understandable that no piano in modern history has ever made itself heard so immediately, or so dramatically. It began as a challenge: could a new kind of piano design eliminate the compromises in performance found in all comparably priced pianos? The Boston Piano Company was formed by Steinway Musical Properties, owners of the world’s legendary piano manufacturer: Steinway & Sons. Drawing on the incomparable experience of Steinway, proven concepts and materials were adapted for the special requirements of high tech manufacturing. And, even with sophisticated computer modelling to speed each breakthrough, the process required six years. While the heritage of Steinway is unmistakably present, all designs for the Boston are unique. There are no interchangeable parts. Playing the Boston piano is proof that technology can indeed be taught to enhance performance, not compromise it. Even a beginning player can clearly hear the difference in a Boston piano. The sound is so full and beautifully balanced, with a long sustain. Boston’s duplex scale, adapted from the famous Steinway design, adds a harmonic richness of tone that simply cannot be duplicated. Also, compared to other pianos, the Boston isn’t as “highly strung.” The Boston’s reduced string tension allows a larger, tapered soundboard, creating longer sustain, and more singing quality in the tone, as well as longer piano life. A wealth of other engineering enhancements, including optimum placement of braces, ribs, and bridges, also contributes to the superior tone. Every Boston has Steinway-designed, pear-shaped hammers and bass strings wound in solid copper. As accomplished pianists have described the feeling, the keys of a Boston piano seem to respond intuitively to the touch. This heightened level of control distinguishes the finest musical instruments. 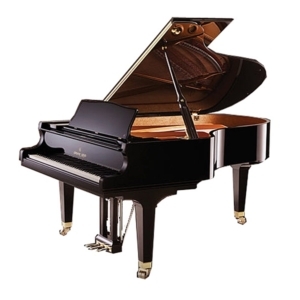 And it’s the direct result of the unique “action” designed by Steinway & Sons, an elegantly complex mechanism that assures nothing is lost in the translation from fingertips, to keys, to hammers, to strings. Boston action parts are 100% wood, not plastic, and provide an extraordinary level of sensitivity. You have the freedom of expression to play as softly, as loudly, or as quickly as you wish. When you hear the bigness of the Boston piano’s sound, you’ll believe you must be playing a much larger piano. The effect is purely intentional. Where does all this power come from? A design innovation gives the Boston piano substantially more soundboard area than other pianos of the same length. 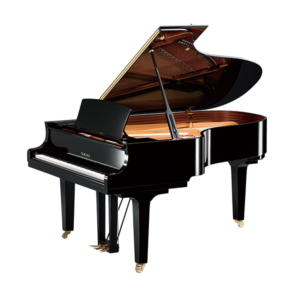 The unique shape of Boston grand pianos makes them wider size-for-size, particularly at the back or “tail,” than grand pianos made by any other manufacturer. In fact, a 5’10” (178 cm.) Boston grand piano has the same soundboard area as a typical 6’2″ (189 cm.) grand piano. The length of each Boston grand, or the height of each upright, is also at the larger end of each standard piano category. For example, while a typical medium grand is 5’7″ (170 cm. ), the Boston is 5’10” (178 cm.). Of course, Boston soundboards are designed not only to be larger, but better. Each one is crafted of solid Sitka spruce, long proven to be the most resonant material available. Boston soundboards are also precisely tapered, rather than uniformly thick. As a result, Boston soundboards vibrate more freely, creating and projecting a bigger sound. So, when you choose a Boston, you get the power and volume of a larger piano without having to pay for it, or make room for it. The attention to detail devoted to the Boston piano is meant to please the eye as well as the ear. For example, Boston veneers are exactly as described: “walnut satin” is genuine American walnut, not “walnut color” over a lesser species of wood. A wide selection of natural wood veneers and finishes is available. Grand piano key covers and tops lock, and tops feature the added elegance of a beveled edge. Pedals and casters are solid cast brass. And while these features don’t add to the Boston’s performance, they certainly add to its beauty, quality and value. To fully appreciate the Boston piano, of course, you must see and play it for yourself. So please accept our invitation to receive a complete presentation of Boston grand and upright models at your convenience. To assure you of the expert knowledge and uncompromising service you deserve, Boston piano dealers are few in number. Chosen for their reputations and expertise, your Boston dealer will be happy to explain the unique features responsible for the Boston piano’s superior sound and touch. And, you’ll also discover the value of materials and design refinements that make the Boston a lasting investment. Selecting a piano is an important, personal decision. And fortunately for everyone who loves the piano, the Boston will make that decision easier, and more enjoyable than ever. Boston grand pianos are wider, particularly at the tail or back, than other pianos of the same length. This allows a bigger soundboard area, producing bigger sound. Lower-tension scaling for longer sustaining tone, and longer life of the whole piano. Duplex scaling adds harmonic richness and longer sustain to the tone. Solid (not laminated), straight-grained Sitka spruce with a minimum of 8 annual growth rings per inch (3 per cm.) for proven superior tone quality. Tapered, rather than uniformly thick, to vibrate more freely and provide more volume. Specially designed closing rims make the soundboard irregular in shape, and improve its acoustical properties. Soundboard ribs are of spruce and are fully let-in to notched liner (uprights) and rim (grands) to support the soundboard crown and prevent the piano from losing its tone. Vertically laminated with a solid maple cap in grands, and reverse crowned in uprights and grands, to create better transfer of sound from bridges to soundboard. Wisconsin Hard (Rock) Maple, laminated multidirectionally, grips tuning pins from several directions to assure a tight fit, uniform pressure, and smoother tuning. Nickel-plated blued steel resists rust and enhances appearance. Cut threads create hundreds of teeth that grip the pinblock and keep the piano in tune longer. Bass strings wound with solid copper, and Roslau treble string wire of the highest grade Swedish steel provide superior tone. “Overstringing” allows maximum speaking length of bass strings. More powerful, longer sustaining tone. Cast from gray iron to the most precise tolerances. “Over-engineered” to provide strength to support 20 tons of string tension. Cabinet parts finished in a wide variety of natural wood veneers with durable polyester or polyurethane top coats. All wood (no plastic) for proven durability, faster repetition, and heightened responsiveness and control. Rosette-shaped, extruded aluminum action rails and flanges mean increased stability and less frequent regulation. 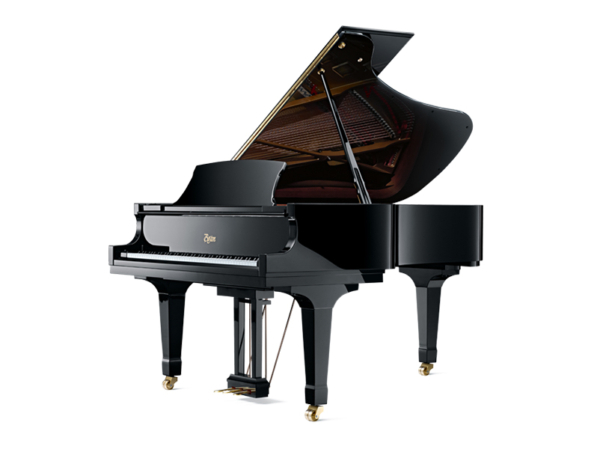 Computer-designed, pear-shaped hammers with reinforced shoulders deliver optimum performance from the Boston piano scale design. Piano keys are spruce, and are individually balanced and weighted. All wood used for making parts is naturally cured and kiln dried to the precise moisture content specified, to assure precision and long life. Grand piano rims and upright case components are laminated Philippine mahogany, for stability, strength and long life. Computer-designed radiating grand braces of laminated Philippine mahogany provide stronger, triangular support compared to parallel designs. Uprights similarly employ staggered backposts. This rigid support increases tuning stability, soundboard crown retention and long piano life. The Boston Piano Company stands behind each Boston piano with a comprehensive warranty providing you with peace of mind for the future. Specific details vary by country. Consult your Boston piano dealer for a copy of the warranty and service program which applies to you. SK6L - 7' Polished Ebony. The Shigeru Kawai Piano... a spiritual union of man, nature and art... a union derived from the innate and inexorable desire for harmony. Yamaha C3X. The legacy of the CFX continues Preserving tradition is not the same thing as refusing to change;rather, it is from the ongoing search for perfection that traditions emerge. The new Kawai GL50 Grand Piano possess all the essential qualities that have made Kawai pianos a preferred choice of pianists and educators for generations. Conceived with one goal in mind—to provide exceptional touch and tone that endures. Yamaha C5X. 6'7" Ebony Polish. The legacy of the CFX continues Preserving tradition is not the same thing as refusing to change;rather, it is from the ongoing search for perfection that traditions emerge.